1975 was the year the Jefferson’s moved on up, the year Baretta and (more significantly for me) his parrot found their way onto the airwaves, the year that Anne Romano moved to Indianapolis with her two daughters, and the year that we saw a horrifying vision of what space uniforms might look like in Space 1999. At the time, I’m pretty sure I could have told you when each of those shows was on the air – and, I went out of my way to be staring at my TV set whenever they were. Somehow, these stories seemed important. A mere four decades (or so) later, somehow they don’t. I don’t even think I could muster the curiosity to watch a whole episode of any one of them. 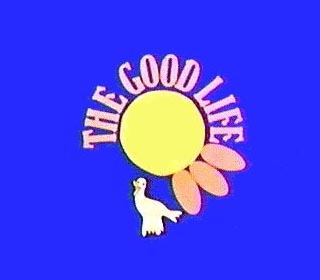 But there is one series that started airing in 1975 that I find myself watching every couple of years: The Good Life (which, if you’re from the US, and watched PBS, you might know as Good Neighbors). It was a charming, witty show about a couple that decides to opt out of the rat race, and become self-sufficient. The series follows them as they turn their home in a residential neighbourhood into a small farm, much to the dismay of their dear friends and neighbours. There are no special effects, no impossibly beautiful people, no murders, no perfect NY apartments, no space ships, and no parrots … but there are pigs and chickens, not to mention great chemistry between the characters. More significantly, almost 40 years later, the show seems even more relevant than it was then – and Tom & Barbara’s determination, passion and values are worth emulating (not something that can be said of many TV couples). This entry was posted in Asides and tagged 1975, farming, Felicity Kendal, Good Neighbors, Paul Eddington, Penelope Keith, Richard Briers, self-sufficiency, Surbiton, sustainability, sustainable living, The Good Life, tv, TV role models, urban farm by Jean-François. Bookmark the permalink. You’ll get no argument from me on the charms of Felicity Kendall, then or now. Still, one didn’t get the uneasy sense that one was looking at a room full of models, who’d had every asymmetry sanded off, every curve enhanced, and every hair plastered into place. I can’t see how that halloween costume would be anything but fabulous. I think you owe it to your blog followers to share any and all photos. I for one, would thank you very much for sharing. You see? I MISSED this one. It was still in my inbox WP folder, waiting to be clicked. But I’m back! I’ve never heard of this show. I will look for it on Amazon – can stream to the Roku box. Their roles are switched for us, I, the emotional one, wanting to do change for good, he, the thinker, the questioner, looking at a thing from all angles. I love the way she just looked at him like he’d gone mad! I’ve SEEN that look. PS – I bought a soymilk maker and tofu press kit. Inspired by, guess who? I suspect it wasn’t very popular in the US, and shown at an odd hour on PBS. Think you’ll find it amusing, though. Very cool about the soy milk maker. We’re really enjoying ours, and our various experiments with tofu and okara – which I’ll be sharing when I have some time. The holy grail for us is silken tofu, though we haven’t quite gotten there yet. The one piece of advice I have is to wash everything well right away. We read that the okara can clog up the filter more or less permanently if allowed to harden, and having played with the stuff a bit, I believe it. It stuck to our cookie sheet most tenaciously. Thanks for the advice, then. I will heed!